Was Publishing The List Of Sexual Harassers In Academia Online, A Welcoming Move? After the Harvey Weinstein case and the #metoo campaign, it was a surge of relief and pride to see the dialogue about the magnanimity of the situation of sexual harassment being realized by all. I have seen naysayers criticizing it on social media saying ‘It seems all women have been harassed in their lifetime.’ Damn right they have been. That is how rampant and huge the problem is. The #metoo campaign was taken a step forward by #himtoo which encouraged survivors to name and shame. Now, name and shame might not be the best practice in most cases, but in a set up where talking about sexual harassment is a taboo, it is empowering in its own way. It would make other possible targets aware of the person and prevent the perpetrators to prey on their next victims. 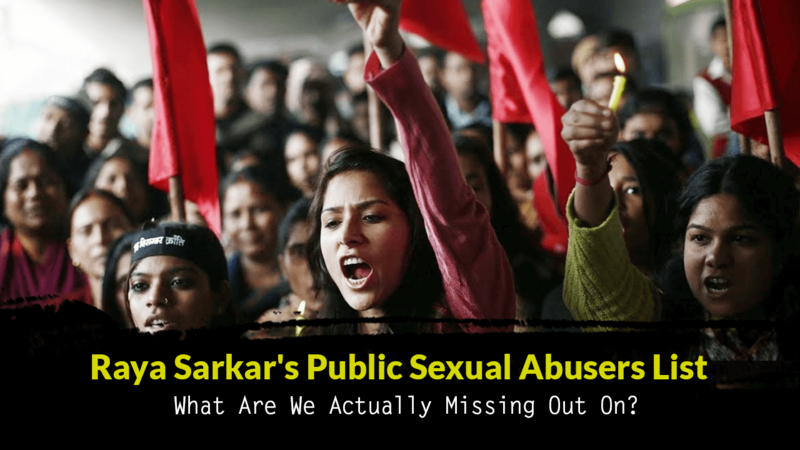 It was possibly in sync with this spirit, a law student from California, Raya Sarkar published the list of supposed sexual harassers from the Indian academia. The list, or so as to say the act, apart from creating a stir among masses, has definitely polarised Indian feminists into two blocks. The list includes names that have rocked the entire academic diaspora of the country. However there is been a constant barrage of criticisms against this drastic step being taken, and unlike most cases, this time the arguments have some merit to them. The first dilemma comes with determining what constitutes as sexual harassment. To cut the disambiguation short, it would basically constitute any act or behaviour that makes another person feel sexually objectified or uncomfortable. But in our bid to keep it simple, an issue as serious as harassment cannot be reduced to being simplistic. Comfort level, varies from person to person and what might be acceptable to one can be discomforting to another. Thus who decides what is harassment and what is not. One possible argument can perhaps be anytime after expressing discomfort in any ambiguous act if the person still continues, that can be termed as harassment. In that case, the question arises, was this nuanced understanding of the act itself taken into consideration while making the now infamous list. In fact, was anything apart from the word of mouth of the supposed survivors taken into consideration before preparing the list, is a question that would bother any rational being. In a vicious set up of academic politics, if even one of the names on the entry is a result of a personal scuffle, then it will push the ongoing feminist movement a few steps back. As it is, there is no dearth of people discouraging and ridiculing the movement, this would give them a foot in the door to negate all the other movements in future. It would not only set a dangerous precedence but challenge the credibility of the feminist movement in itself. The fact that no distinction was made between accusation and conviction makes the whole situation extremely convenient and makes something as serious harassment somewhat simplistic. Adding to that, if you look at the list carefully certain discrepancies are bound to jump out immediately. Firstly the majority of the names (not all) belong to a certain community. It brings out an inherent flaw in the way the exercise was carried out. It is clear that the list was, perhaps unconsciously, circulated in a particular circle or geographic location majorly. Thus it fails to give a clear picture of the huge spectrum of Indian academia. Even assuming that all the names mentioned in the list are actually perpetrators, it not being an exhaustive list is grossly unfair and gives an undue advantage to academics around the country, who indulge in the heinous act but are not on the list simply because it did not circulate in the circle that they operate in. Secondly, the fact that there is not a name of a single female academician on the list propagate the idea that women cannot be perpetrators of sexual harassment. Again, this would empower the critics who argue feminism in the country has reduced itself to male bashing. Yes, perhaps the fact that it is not an exhaustive list is not the fault of the maker. Academics in the country includes a huge population and a sample survey across the spectrum is probably not possible, but in that case publishing the list that does not show the broader picture is not going to serve any purpose. As the saying goes, a half-truth is more dangerous than a full lie. However, to nullify the list just because it gives a jolt to our sensibilities and makes us uncomfortable is exactly the mindset that feminism has to rage a war on. (Yes, war, because that is how serious the issue has become). Defamatory or not, the fact that such a drastic step was taken just goes to show that we have had enough and it’s time to cut through the b*******. The list would not have existed if the mechanisms necessary to prevent or penalize harassment would have been in place or those that are there would have worked the way they were supposed to. This act was a clear indicator that the culture of silent survivors is coming to an end. And even if one act of harassment is prevented or penalized as a result of this list, it would be more successful than well thought out policies and practices that have failed to yield any results. The end justifies the means? Perhaps. But what sets feminist struggle apart from any other social or political struggle is a deep-rooted belief in certain principles and ethics. Taking a route as drastic as this might be pragmatic, it might even lead the movement to a certain socio-political victory, but hasn’t feminist struggle always been more about ideological victory? And, that is where perhaps the list fails miserably. This Video Of Piyush Mishra Talking About Alcoholism Is Amazing And Needs To Be Watched..! !